Work with a functional medicine doctor. Whether you choose to work with us or another functional medicine practitioner, it will be worth it. Do an Elimination and Reintroduction Diet. You need to figure out if food intolerances are contributing to cause of your condition and/or your symptoms. Our motto for an Elimination/Reintroduction diet, “Do it once and do it right.” Our Foundation Protocol is an excellent option as we concurrently address address your gut health with hand-picked supplements. If your gut is leaky, you might end up thinking you have food intolerances to a LOT of things. If you’d like to learn more about our Foundation Protocol and how it might help you, fill out our patient enrollment form here. Supplement. 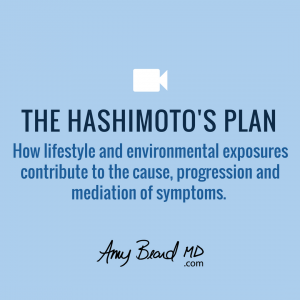 There are several supplements that may benefit someone with Hashimoto’s. These include 200-300 mcg of selenium, vitamins A and D as needed, NAC (N-Acetyl-I-Cysteine), and of course a good broad-spectrum multivitamin. You can visit our Fullscript site for trusted brands. Get Thorough Labs. These are the labs we consider when working with Hashimoto’s patients: TSH, free T4, free T3, thyroid antibody levels, iron, ferritin, reverse T3, a 24 hr urine iodine concentration, celiac panel, heavy metal testing (mercury especially! ), cortisol levels and a stool study.